The subject has been under discussion on social media with varied views for the last few months. Some one has rightly named the same as expanded jargon as if it is hell of a task to work out the IT Relief. Like wise as for other posts on calculation of Arrears of Pension posted here in this web site in the past we have simplified the entire explanation and the methodology to a Primary Class Maths Play. The relief in income tax amounting to about Rs 20 to 40 thousand is worth the effort on your part to take advantage of this do it your self solution. Hence do get hold of your IT file and the past ITRs of 6th CPC period and follow the simple steps. Our team has studied the entire issue in detail and after consultation with classified financial experts have brought this post for your benefit structured specially for Faujis which can save as much as approx Rs 30000/- of Income Tax during the current Assessment year (2016-17) for an ESM of the rank of Maj and above in most cases. Tax saved is money earned. The CAs who file your income tax make it so difficult for you so that they can justify their demand of a portion of the relief as their fees..
Let us briefly look at the provision of "Relief on IT" so permitted on arrears under Sec 89(1) of the IT Act. 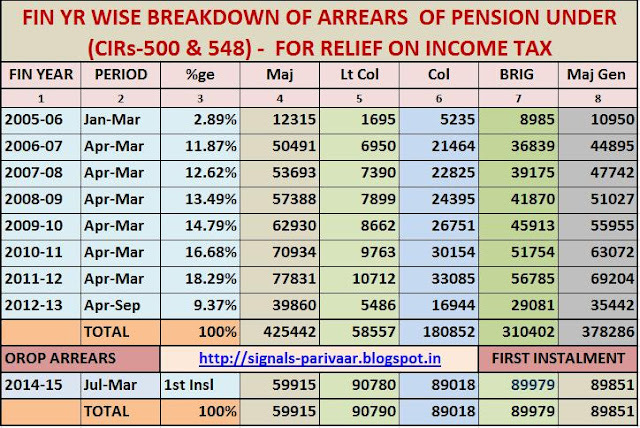 B.—Relief for income-tax] 54 [Relief when salary, etc., is paid in arrears. 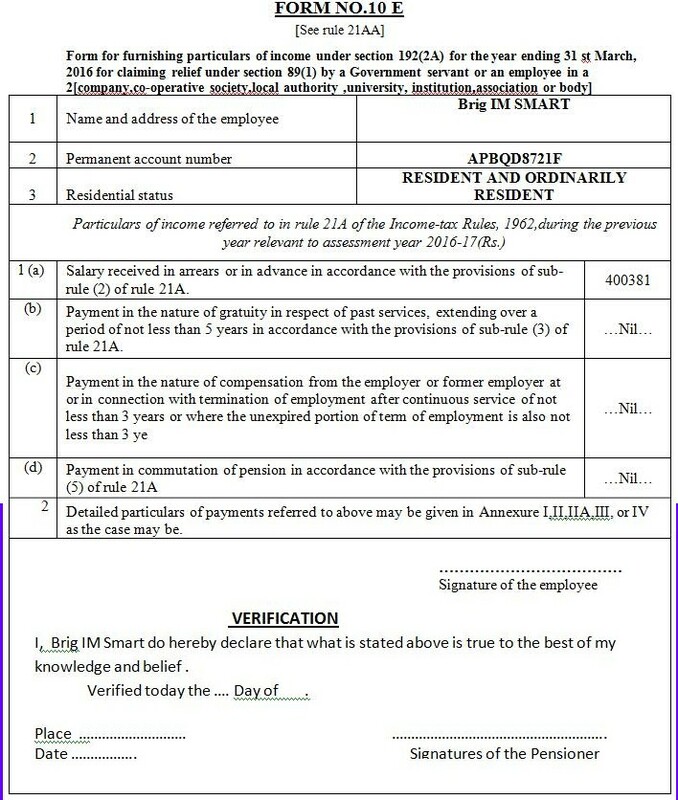 Where an assessee is in receipt of of salary (Pension) for more than twelve months being paid in arrears in any one financial year, due to which his/her total income is assessed at a rate higher than that at which it would otherwise have been assessed in the past, the Assessing Officer shall, on an application made to him in this regard, grant such relief as may be prescribed. (ABRIDGED). During the FY 2015-16 for which we are to file our ITR now we have received arrears on Enhanced Pension for the period from 01 Jan 06 to 23 Sep 12 amounting to nearly Rs 3 lakh and OROP Arrears 1st Installment of approx Rs 89000 depending upon the Rank and QS of the Officer.. These arrears of about Rs 4 Lakh, when added to the pension for the year and your other income on interest on investments are likely to take majority of the pensioners to the uppermost slab and taxed at 30%. The arrears which otherwise pertain to your entitlements of previous years from FY 2005-06 and later, will be Taxed at higher rate than they would have been taxed in the previous related financial year where the rate could have been 10% or 30% at the maximum..
SEC 89 (1) of IT Act entitles you to relief in IT as mentioned above by splitting the total arrears year wise to which they actually belong and adding them for taxation to the Taxable Income of that particular previous year. 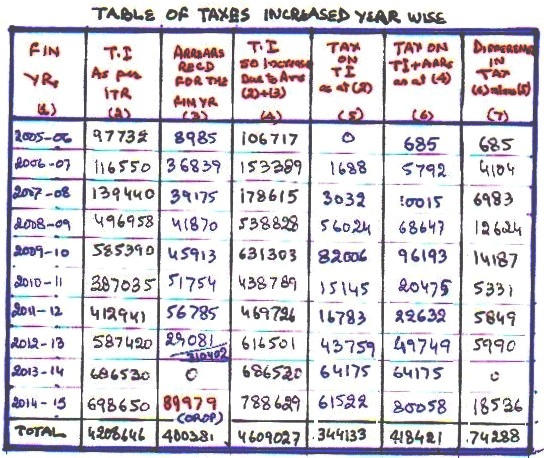 The said relief will be to the extent of difference in the total of Past Income Tax, which one would have paid in case this amount of arrears was received in that particular year as part of the total income of that year compared to the Income Tax which is now calculated for the Fin Year 2015-16 by adding the total arrears received during FY 2015-16 and shown in your Form 16 issued by your pension Bank. The term "TI" (total taxable income) is the final figure of your income after applying all types of deductions on which the Income Tax is finally calculated. The IT Department requires the submission of Form 10E which is nothing but a calculation sheet to arrive at the total relief in a prescribed format. The same has been explained in lay man's terms and simple to comprehend. in this web post. A sample of the same based on an actual example is also up loaded for your ready reference and guidelines to empower you to work on it yourself..
(a). 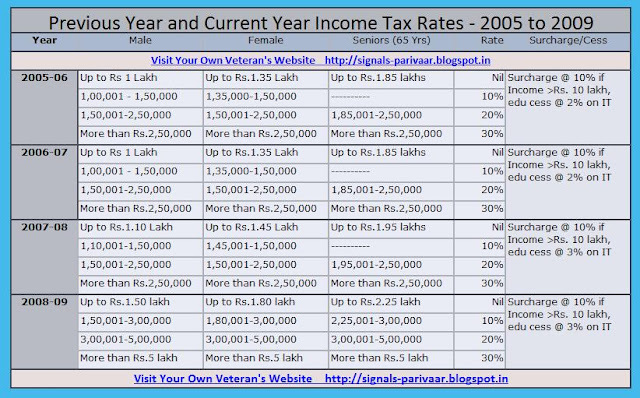 Your year wise figures of Taxable Income (TI) as per your ITRs and the Total Tax paid incl SC and Cess as applicable for the previous FYs starting from FY- 2005-06 till FY 2014-15. (c). Note down the figures of Arrears received for Enhanced Pension up to 23 Sep 2016 (Without TDS). These are to be split Past Yr Wise with the help of percentages specified in the Chart showing Breakdown of the Arrears. (d) Note down the figure of the First Installment of OROP Arrears. Add both to get total arrears. The first instalment of the Four in OROP is less than the auth arrears for the FY 2014-15 as such should be incl for FY 2014-15. The Family Pensioner received all the OROP arrears in One Go as such they need to split them for 9 months in FYs 14-15. (e) Check as to when you became a Senior Citizen for Taxation purposes. untill FY-2010-11 the age specified for a Sr Ctz was 65 years. and reduced to 60 yrs during the following year. FIRST - The total Arrears received during he FY 2015-16 are to be split in to values related to the previous Financial Years to which the portion belongs to. This has been termed as an extremely difficult and tedious task, however Signal's Parivaar gives here a Primary School Method. The breaking down of the arrears specially for the enhanced pension has been simplified as percentages of the total arrears to give you the portion of the arrears for a particular related year. The Table below under Column "3' contains the percentage. Multiply the total arrears with this percentage and you get the portion of the total arrears for the FY to which it belongs under column '1' for the period in months (Column '2'.). 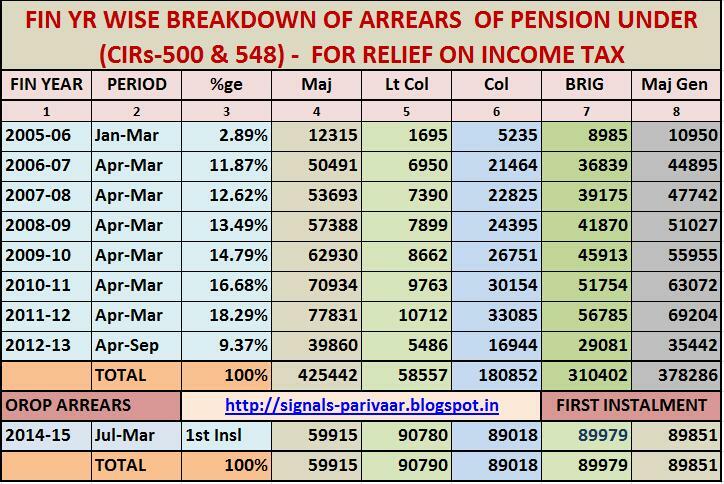 Note : In order to simplify the issue further the breakdown of arrears for various Ranks with full Pension (QS) have also been given on plate in this chart. SIMPLE ISN'T IT. ..... "Cheers"
WE WILL PROCEED WITH THE EXPLANATION WITH AN EXAMPLE BY ASSUMING SOME HYPOTHETICAL FIGURES OF TAXABLE INCOME FOR THE PAST YEARS. 1. As you notice above we have taken the arrears accrued from Jan to Mar 2006 for the year 2005-06 above. Many of our readers have opined that we should take only two months i.e Jan and Feb months since the pensions for Mar are only paid in Apr. We have felt otherwise since these are not the payments but accruals for the past Financial Years as such we should follow the norms for a Financial Year counted from Apr to Mar. 2. We have carried out in house calculations by taking the arrears from Mar to Feb in place of Apr to Mar and find that in the calculations shown later in the post there is slight reduction in the relief amounting to Rs 341 only. 4. The table above shows the Year Wise "PERCENTAGE SPLIT FACTOR" for the past Financial Years. The Arrears received for the period from 01 Jan 2006 to 23 Sep 2012 be multiplied by this percentage and result will be the Splitted arrears for the Year. Thereafter the methodology is just the same to arrive at FORM 10 E.
SECOND - Work out TAX incl Cess on your taxable income for FY 2015-16 EXCLUDING ARREARS as per slabs applicable for current AY 2016-17. THIRD :: Now work out "Tax incl Cess" on your taxable income for FY 2015-16 INCLUDING TOTAL ARREARS as per slabs applicable for AY 2016-17. Note down the difference i.e the increase in the taxes worked out with and without adding the arrears. ** Insert these fiigures in the chart above. FOURTH :: As next step similarly work out the year wise TAX as applicable on the Broken down amt of TIs of previous years (year wise) first without adding the portion of arrears and then by adding the arrears of the particular year, Note the difference ie increase in the year wise TAX which has increased because of the addition of the elated Arrears in that year i accordance with the the applicable slabs and the rates for that year . These should be put in a chart format as explained in the succeeding paragraph. 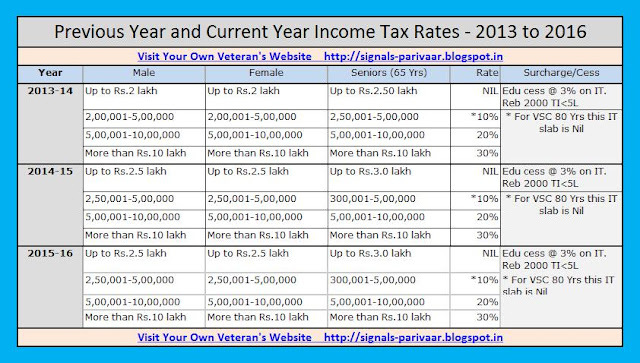 Note 1- Income Tax Slabs and Rates - The previous years slabs can be downloaded from Google . However we have for your convenience placed these right here at the end of this web page covering the entire period of 6th CPC. 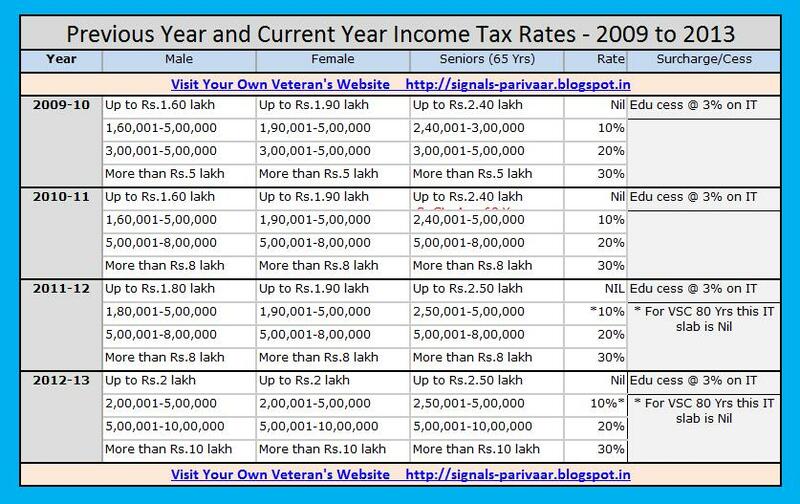 Note 2 On Line Tax Calculator . On searching google.com one will be able to find number of on line tax calculators for previous years. Income Tax Dept site http://incometaxindiaefiling.gov.in/ also has Tax Calculator starting from assessment year 2009-10 on wards which are easy to use. Simply fill in your T.I and your status, you will get the tax payable on this TI. FIFTH - Preparing the Chart and Arriving at the RELIEF. In order to understand this process in simple terms we have taken the above mentioned figures of arrears and hypothetical Total Taxable Incomes of previous years. These are charted in the following chart. The First installment of the OROP amounting to Rs 89979/- is far below the arrears that accrue for the period from 01 Jul 2014 to Feb or Mar 2015. We should therefore consider them as the arrears for the FY 2014-15 as in the chart. The TAX with and without the addition of arrears for the year are also shown so worked out at applicable rates in relevant columns.in the chart below. One should have no difficulty in understanding the figures in each column and row. NOTE : The assessee became Senior Citizen during the Fin Year 2010-11 as such applicable have been slabs used for calculation of tax from 2010-11 on wards. Please note that the total under column (7) above i.e Rs 74288/- is the increase in Taxation because of the addition of year-wise arrears from the erstwhile Tax paid. Rs 74288/- MORE IN INCOME TAX. SIXTH - Calculation Of Relief - Its simple again . The arrears amounting to Rs 400381 have been received during the last financial year and are being reflected in the FORM 16 being received by us. This amount of Arrears has increased our Income Tax by Rs 105876/- as worked out above than the tax in case these arrears were not received. However in case these arrears were paid in the past the increase in Tax works to only Rs 74288/- . WHICH IS OUR REAL LIABILITY. GOOD NEWS IS THAT THE INCOME TAX DEPT UNDER SECTION 89 (1) WILL GIVE YOUR RELIEF IN TAXATION FOR THE AMOUNT OF INCOME TAX BEING WORKED OUT DURING THE CURRENT ASSESSMENT YEAR IN EXCESS OF Rs 74288/- . While the relief amount is reflected in the appropriate field in the ITR where the amount of relief gets reduced from the total Tax, the pensioners are required to submit FORM 10 E in support of their relief claimed from the arrears. This form is of two pages as shown below. Page one is the summary and verification from the pensioner. Page two is "Annx -1" which contains Particulars and Table A which simply tabulates the calculations made by you on piece of paper as mentioned earlier. On closer look you will notice that the data which you had worked out above and made into manuscript tables is the one which has been used to produce this Fom for Submission. SLABS TAKEN-- In the above Form for the years shown are the Financial Years . The subject assessee became senior citizen during the FY 2010-11. as such his calculations from the Fin Year 2010-11 on wards are based on slabs prescribed for a Senior Citizen. The calculations thus upto FY 2009-10 are as for a MALE Assessee. ON LINE UTILITIES - There are many on line applications available launched by various establishments which file ITRs on behalf of their clients. They are simple to use and need only filling up the arrears spitted as per past years and the applications does all calculations for you and also produces Form 10 E. One can make use of them as well if one can however care should be taken that the calculations are for the age of the assessee. Any mistake if made in the Form the responsibility will be of the assessee and the Income Tax Department may not admit the Relief because of these errors. It will be worthwhile to recheck the outputs by manually calculating as well. ITR - First after you have calculated your data you may prepare your ITR for efiling based on On line Forms ITR-1 or as applicable. These forms has a field to insert the Total amount of Relief claimed. This amount gets reduced from the over all tax liability. NOTE:- Once again its a simple affair, the form can be prepared and submitted on line. However please note that the years as they appear there on line are assessment years. The data as prepared by you is to be entered on line. NOTE - We will appreciate your inputs in the above issues. FOR THE PREVIOUS YEARS (6TH CPC) FOR REFERENCE. NOTE : The Years show here are Financial Years in these tables. .
1. We at Signals-Family Portal are ordinary people, as such, do heavily bank upon inputs from our readers on issues concerning us all. Kindly do add, comment and give your observations on this or any other post aimed at improving the posted contents for the benefit of the veterans community. 2. Kindly post these under the comments, we will much appreciate your contribution in this regard. 3. In order to avoid spam and unwarranted or mischievous posts, only such entries will get published where the Person has given his RANK, NAME & EMAIL ID at the end of his/her text. You will agree that we must know as to whom we are communicating. 4. We will do our best to post our response as quickly as possible after getting the facts vetted from offrs, JCOs and men who are more knowledgeable on particular subject. I am in receipt of Disability Pension. I received 3 Lakhs as arrears. Since it is considered that Disability Pension is exempted from paying IT, the same should hold for OROP Arrears. Kindly clarify. for arrears of pension and OROP. How about persons like me in receipt of Disability Pension? Normally any pension /Arrears received by me is exempted from paying IT. Does this also cover under that rule? Thank you so much for simplifying the process to calculate the tax liability for all of us. It's indeed a great service you have done especially to veterans like me, who just did not know how to go about this complicated issue. You have made it look very easy to understand and workout correct liability resulting in savings of thousands of rupees. My case is even more complicated because I had not even received my Rank Pay arrears since 1986, as I live in USA . I came back to India last year and took up the case with CDA Officers/ Pension to get my Rank Pay arrears and finally got these arrears also during the last financial year. I would like to seek your help in working out my tax liability from 1986 and would like to communicate with you directly, if you may like. My email ID - colonelsandhu@hotmail.com. May I have your email ID. Once again we are so grateful to you for this service to all the veterans. How do we submit the Form 10E ? ITR is submitted online and No atts are allowed. Is prior sanction required for relief under Sec 89 ? since I donot have the Rates of Dearness Allowance pertaining to that period from 01 Jan 1986 to 31 Dec 1995 it will not be possible for me to do the need ful. We had thus claimed no relief for these arrears which were in the range of about 40000 only. The entire arrears should be exempt of income tax since your service as well as disability elements are exmpted. I once again request you to kindly write your Rank name and email ID under your comments so that we can respond to you appropriately. I also thank my fellow veterans who have mailed me encouraging words for this site, the site is yours and gets updated with your contributions by adding views and write ups. you are doing a Yeoman's service to the ESM community. Sir, at the end of the day, it had to be another brother officer out there to help us cross the hurdles with ease. It is so reassuring. Thanks a lot for conceiving and leading this blog. Thanks Sir for the great effort by you for the benefit of all of us. We need not know the rates of IT for 2006 onwards. The IT calculator at the incometaxindiaefiling.gov.in website does the calculation in a jiffy. thanks a lot for saving our effort. i would like to know if salary arrears of feb. should be added to income of next FY. It is very helpful. In all the IT forms only A.Y is used. So in form 10E annexure also for the column previous year(s), I think we should use only A.Y and not the F.Y . i presume that ur reply was in response to my querry.in that case, i would like to say that when govt. says that arrears for the month of jan.2005,it wold mean receipt on 01 feb.2005.similarly,arrears for mar.would mean receipt on 01 apr.therefore.for FY 05-06,we have received arrears only for jan.& feb.Mar. salary would get reflected in next FY.similarly,in every subsequent year,receipts would b for the period mar. to feb.
rest is only a question of formatting ie; FY or AY. How does a family pensioner calculate the relief specially if they are receiving family pension after 2012.From 2006 to 2012 or the date of receipt of family pension the relief will have to be calculated for the offr and then for the family pensioner. could you please clarify. 1. 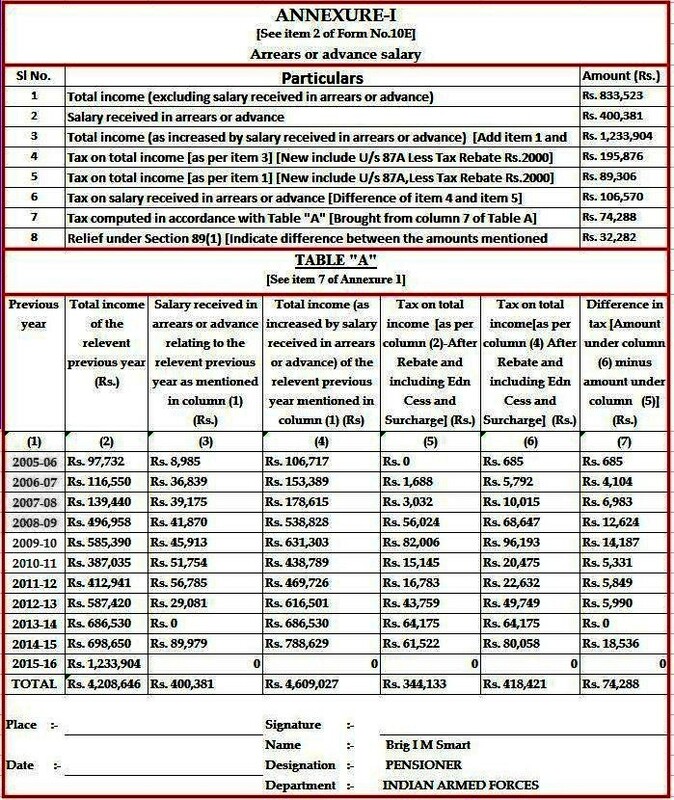 Many of us must have claimed rebate under section 89 for VI CPC arrears received after issue of PCDA Circular.In their case, revised total income and tax for FY 2005-06 till tho FY when arrears were actually received, would have been reflected in Table A which would be higher than what they had reflected in their original returns. You may like to inform assesses to look after this aspect rather than just copying figures of total income and tax for the corresponding AY returns(columns 2 and 5 of Table A of Form 10 E filed earlier). Kindly advise whether or not these figures should be what were reflected in columns 4 and 6 of Table A of Form 10 E submitted by them earlier. All rates of DA wef 01 Jan 1986 is available on internet. Thank you very much, Team Signals Parivaar! Great job done, a doubt remains. I have recd arrears in two instalments. during FY 12-13, 14-15. for which IT returns already filed. can I ask for rebate now? sir, I recd arrears in two instalments during FY 12-13, 14-25. Can I ask for rebate now? You seem to have included all the OROP Arrears in the FY 2014-15. Shouldn't you have distributed the arrears in 2014-15 and 2015-16? IMO that would be the correct way to do it. Your entire pension is exempt from Income Tax. Whether Qualifying Service (Q.S) is to be taken as actual or with weightage? In Post-2006 retirees cases, weightage had been withdrawn from Qualifying Service. Therefore, the qualifying service mentioned in OROP table is actual qualifying service only. No weightage in qualifying service is to be allowed at all while extending the benefit of OROP in past cases. For example, if actual Q.S. was ‘q’ years and weightage, if any, was ‘y’ years, the pension indicated in the concerned table for ‘q’ years only is to be paid to the pensioner. I had received arrears due to revision of minimum w.r.t PCDA circulars 547 & 549 during December’ 2015. I also received arrears of OROP 1st installment w.r.t PCDA circular 555 in March’16. Despite repeated requests to Pension paying branch, cppc.delhi@bankofbaroda.com & cppcdefence@bankofbaroda.com, and having lodged 03 grievances at online grievances portal, I have been provided the break-up of OROP arrears only and CPPC closes the grievance by saying that details have been provided (referring to details of OROP arrears). Resultantly I am not in a position to avail rebate of Income Tax by spreading the arrears to relevant preceding years u/s 89(1). How to go about it ? Last date for filing is drawing closer, plz respond ASAP. PRC 04 DEC 1954 RETIREMENT 31 JAN 1986. A revised return can only be filed if the original return has not yet been processed by the IT Department. If it has already been processed, you can only file a rectification return through your IT Assessing Officer. 1. After retirement in Oct 2006, I have my pension acct in HDFC Bank. 2. I recd a sum of Rs 41, 340/ as OROP Arrears in Feb 2016 and a sum of Rs 10,574/ was deducted as "TDS on Arrears" as per my Bank Acct Statement for FY 2015-16. However, these amounts do not figure in my Form 26AS or Form 16, causing confusion in online filing of my ITR 1 for AY 2016-17. 3. Pl advise. Thanks and regards. 1) Revised returns can be filed if you filed your original return within due date. So if you filed your return after due date then you are not eligible to file revised return. 2) Revised return can be filed at anytime before the expiry of one year from the end of the relevant assessment year or before the completion of the assessment, whichever is earlier. For example, for financial year 2012-13 assessment year will be 2013-14. So you can file revised return of FY 2012-13 upto 31st March 2015 (end of assessment year 2014-15). 3) You can file revised return only if you found any omission or wrong statement in your previous return. But not for any concealment or false statement. 4) You can’t file revised return if income tax department already did assessment of your return. 5) You can file revised return if you missed any deduction or income. 6) You must have 15 digits acknowledgement no. and date of file to revise return. 7) Return can be revised any number of times but within the time frame what I mentioned above. 8) A loss income can also be revised and can be carry forward. 9) If found concealment of income from original then it will be penalized. 10) Penalty for such act will be 100% to 300% of your tax dues. 11) Usually revised returns will go through higher scrutiny from IT. 12) Revised return is the substitute to the original return. You can either use online or physical mode of return filing. But if you filed original return online then you have to file online mode only. Open the excel file where you originally filed return. Mentioned as revised return and select the Sec 139(5) instead of 139(1). Do the necessary changes to your return. 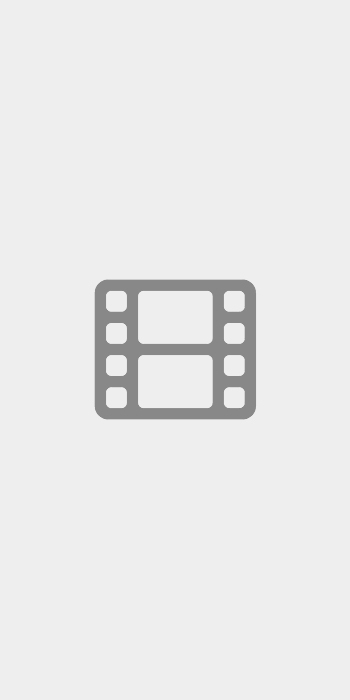 Fill acknowledgement number and date of original return. Click on compute tax, generate XML file by validating each sheet. Upload the file to Income Tax e-filing site. 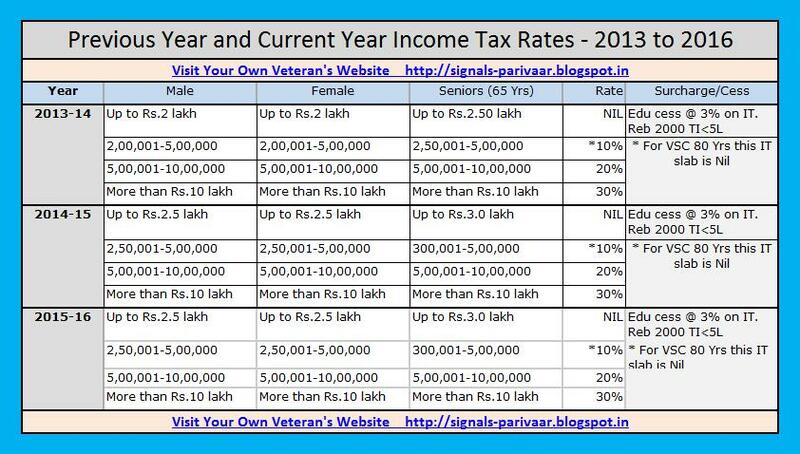 Download the revised ITR and sign it. Send the original and revised ITR sheets to CPC Bangalore. My Name is Lt Cdr Sudhakar Chopra email is sudhakarchopra@gmail.com. 1. I really appreciate the efforts made by you in giving the method of obtaining tax benefit on the arrears under section 89(1). a) The basis of breaking down of the arrears into percentages. Because I feel that ratio would not be applicable for OROP arrears, the period not being the same. b) If most of the previous years' incomes have been above or equal to the present tax bracket (10%, 20% or 30%) then, would it not be better to take the arrears in the current year's income only. I did mistake in filling Form 10 E, how can i do correction. The guidance to file Form 10 10E for the AY 2016-17 had been of immense help in filing the return. I could save about Rs 6000/= as I prepared the Form 10 E on my own.I got refund in Sept 2016. It is suggested/requested that guidance for the AY 2017- 18 is again provided. The good advice rendered is sought again, We have received two installments of O R O P ( 09/2016 & 03/20) & 7 C P C difference for 01/2017 & 02/2017 pension. Really good info for working out the IT refund. Shall work on the details please. However, our Bankers (eg. SBI) uses a different Software to arrive at TDS. If the Bankers can apply the approach suggested by you, lot of inconvenience and loss of money could be avoided, the issue being same for majority of the veterans. Thanks. Thank you and Sig Parivar for the earnest and laborious effort put in in working out and explaining the details in a very understandable form. Though we are not good at IT planning, after having gone thru the blog, few times I was able to get the conceptual aspect of the system. Congratulations Sir and Thanks for making us understand it. Sir, If you do not mind can I ask for a small doubt. We have received the third instalment of arrears of OROP in end Feb 2017; On 21 Feb Rs 84454/-, the 3rd instalment bot credited to bank. That means, we got 1st instalment during FY 2015 and 2nd and 3rd instalments during FY 2016-17. My question is, is it possible to split the arrears of OROP alone to previous years with out disturbing the 6th CPC arrears and such like other arrears. That means, is it possible that arrears so far received, Rs 84454X3 = 2,53,362 only can be split to FY 2014 onward or earlier years? How and what persentage can out of this be allotted to which all FYs? We are clear about splitting of arrears of 7th CPC. 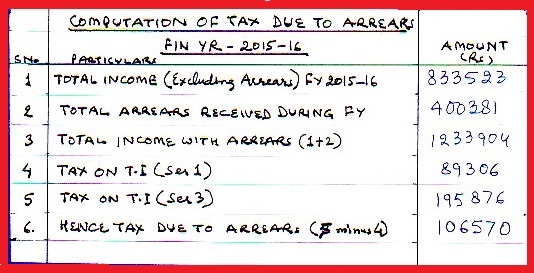 3 months arrears, Jan to Mar arrears can go to FY 2015-16 and remaining will be accounted for FY 2016-17. This is not a problem. Splitting arrears on account of OROP is a problem. This site has done a wonderful job giving information which is to the point and very useful. I have a querry for arrears received in FY 16 17. We have received two installments of OROP and one arrear of recent pay commission. How these will be broken up to previous years to which these belong ? Would highly appreciate a response. Great effort through this Blog to entire family of veterans and NOK. Thank you.I received a refund of Rs 4650 for AY 16-17. Same tables as for AY 16-17 would apply, both for OROP and 7 CPC arrears ? Anyone from Signals Blog Team visiting Pune , I would be delighted if they could spare some time for me. Pl let me know how I could help in this noble effort.